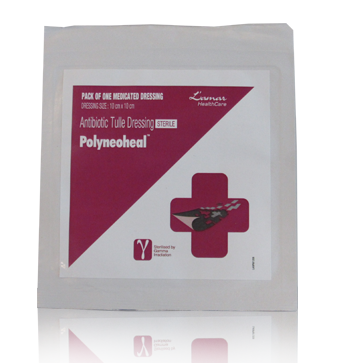 It is effective against lowering infection rates in sutured wounds. Each dressing contains ointment with Polymyxin B. Sulphate U.S.P. .....5000 units, Bacitracin Zinc U.S.P. .....400 units, Neomycin Sulphate U.S.P. .....3400 units. Triple antibiotic combination of Polymyxin B. Sulphate + Bacitracin Zinc + Neomycin Sulphate helps to lower infection rates in wounds sutured in emergency room. Remove the dressing and follow routine wound management procedure as per physician’s advice.